Ask most anyone interested in finance what they remember about the late 1990’s and they will say the Dot-com bubble. Fed Chair and Maestro, Alan Greenspan, in one of his few comprehensible utterings, made “irrational exuberance” part of the bull market lexicon. Low interest rates provided the fuel for the tech laden NASDAQ index to shoot from under 1,000 in 1995 to over 5,000 in March 2000. Thousands gave up honest work to be full-time day-traders. From 1995 to 1998 the Fed lowered its Fed Funds rate from 6% to 4.75%. The M2 Money Supply grew 22 percent in the same time frame. The prices of worthless stocks soared upward only to crash in spectacular fashion. Pets.com shares went public at $11 only to enter liquidation 268 days later with its stock trading for 19 cents. However, stock trading was just part of the late 90’s mania. Entire college and retirement funds were funneled into the can’t miss speculation of Beanie Babies. The small beanbag animals that creator Ty Warner wanted every kid to have, sold at retail for $5.00 but were hunted and hoarded by obsessed adults who sent the prices for these fuzzy plush animals into the hundreds and thousands of dollars. 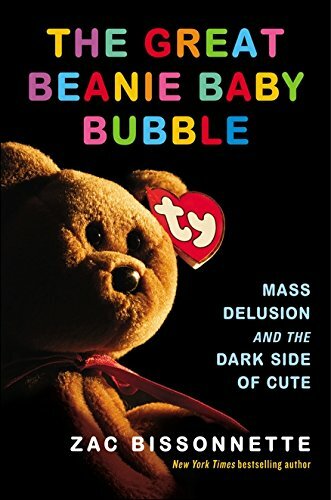 Zac Bissonnette writes in The Great Beanie Baby Bubble: Mass Delusion and the Dark Side of Cute, “frenzied speculators had turned [Beanie Babies] into a craze that was the twentiethcentury American version of the tulip bubble in 1630s Holland.” While the Beanie Baby bubble lacked the credit component most all bubbles have, the zeal for certain profits and belief in the toys being sound long-term investments was the same as for tulips, houses, and stocks. The craze, in addition to its occurrence during the easy money 90’s, was also spurred by the embrace of a new technology, a common element to many bubbles. In this case it was Ebay and online auctions. In an interview on MSNBC, Bissonnette said some Ebay insiders told him there would have been no Ebay without Beanie Baby business. The author writes the craze, “is probably best understood as late-1990’s speculative capitalism merged with a massive collective flashback to the comfort stuffed animals provided in our early years.” The Great Beanie Baby Bubble is anything but academic, with much of the book devoted to chronicling the life of the quirky, eccentric, and downright disturbed toy entrepreneur, Ty Warner. He had a troubled childhood. His salesman father distant, his pianist mother a paranoid schizophrenic, who spent most days in bed with a washcloth on her face, and demanded her husband beat their children with a belt. His father gave Ty (named for baseball legend Ty Cobb) his start in the toy selling business and the young Warner would become a member of the Forbes 500 with a net worth exceeding $2 billion. As obsessed about his appearance as he was with his toys, Warner constantly had plastic surgery. “He looks like he should be in a wax museum,” someone whispered about the 69-year old in a Chicago courtroom in 2014. Probation and community service was his only sentence for evading millions in taxes. Warner first created Beanies in 1993 but they initially went nowhere. He personally designed each and every one and oversaw the manufacturing in Asia. At least that’s what he claimed. When investment bankers came calling, Warner ignored them. He would only sell to mom-and-pop stores, shunning big box retailers, not wanting his toys thrown into and sold from big bins. The turning point began during the 1995 Christmas season. “I had a few in October,” a retailer recounted. “They weren’t selling. Then in mid-January  they took off like crazy.” At the epicenter of the Beanie Baby liftoff were a couple Chicago-area housewives, Becky Phillips and her friend Becky Estenssoro. The two Beckys began collecting and nearby collectables dealer Richard Gernady began placing large orders. Dr. Paula Benchik-Abrinko soon became hooked after spying the toys in a hospital’s gift shop. The doctor’s sister Peggy Gallagher began collecting as well and soon they had to look outside Chicago to find rarer pieces. While Benchik-Abrinko was doing research that involved calling hospitals around the country, she would speak with gift shops in those hospitals to see what Beanies they had in inventory. The sisters’ monthly phone bills were $1,000 as they looked for Beanies around the world. Gallagher bought some Humphrey the Camels for $5 each in 1996 and a year later Humphrey was selling for more than $2,000. Gallagher bought 198 Beanies for retail prices from a seller in Nuremberg, Germany. A year and a half later she sold 30 Chilly the Polar Bears for more than $1,800 each after paying $7. She had purchased 36 Peking the Pandas that became worth more than $2,000 each. The total order that cost her $2,000 was worth more than $300,000. These Chicago collectors became the market and all sought to have complete sets. What came next were magazines reporting on the craze, providing the price lists that fueled the fire. Mary Beth’s Beanie World reached one million in paid monthly subscribers. Les and Sue Fox had no success in the publishing business until they gambled their daughter’s $100,000 college fund and self-published The Beanie Baby Handbook. They sold three million copies making predictions that Beanie Babies would be every bit the investment that Picasso’s paintings turned out to be. It was the fastest-selling collectables book ever and while Warner sued the Foxes for 96 Journal of Prices & Markets copyright infringement, even after the settlement the authors kept millions. The Foxes came out much better than ex-soap opera star Chris Robinson who invested $100,000 of his kids’ college fund buying 15,000 to 20,000 Beanie Babies. He began buying in 1998 at the height of the craze and still has all the Beanies as evidenced by a YouTube video made by his son entitled “Bankrupt by Beanies” which has nearly 300,000 views at this writing. Warner’s tactic of retiring some Beanies had always served to increase the secondary market prices until, it didn’t in 1998 and 1999. The Beanie craze was over as suddenly as it began. The author said he expected Beanie collectors “to be obviously insane,” but found them “reasonable, intelligent, highly functioning people.” The smartest can be caught up in a financial craze, as Sir Issac Newton demonstrated by going broke speculating in the South Sea bubble mania. Feb 12 Sin City's other Main Industry: Land!